RTC: Rural’s Knowledge Translation (KT) and Resource Center program is a national resource for rural people with disabilities, their families, and service providers. The Center communicates our research findings to a broad audience to facilitate knowledge use and adoption to result in increased community participation of people with disabilities and the development of solutions to rural problems. Increase awareness of evidence-based rural practices by disseminating research findings using a variety of methods appropriate for the targeted audience. Increase knowledge and skills for providing rural services by providing training for targeted audiences. Support the adoption and implementation of new practices by providing useful and timely technical assistance. Serve as a National Resource Center for individuals with disabilities living in rural areas, their families, service and support providers, and other stakeholders. RTC: Rural uses a blended knowledge translation approach that ensures research-based solutions to problems fit the uniqueness of the rural context. This approach involves Participatory Action Research (PAR), Integrated Knowledge Translation (IKT), and End of Project Knowledge Translation (EKT). PAR engages knowledge users in research planning and development to make sure research projects are relevant and useful. 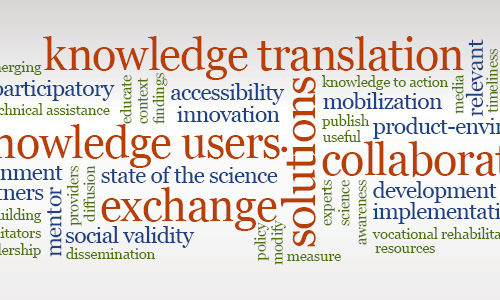 IKT involves a variety of knowledge users in the research process through a collaborative partnership between researchers and knowledge users to co-produce knowledge and to effectively translate it into action. This is vital because knowledge users best understand rural people, communities and environments as well as how to incorporate results into the rural context thereby moving research into practice. EKT is conducted to diffuse, disseminate, and apply research knowledge. The IKT process and the knowledge user input within it influences how EKT is conducted. To apply this KT approach, we have developed the RTC: Rural Advisor Program–a new way to engage knowledge users and stakeholders throughout each stage of the research process to identify appropriate knowledge translation strategies that ensure relevance, adoption, and use. The RTC: Rural Advisor Program organizes consumer voices to influence research and development that address rural disability issues. The RTC: Rural Advisors provide recommendations, contribute to research and development activities, and help shape the RTC agenda for developing solutions to issues experienced by people living with disabilities in rural America.